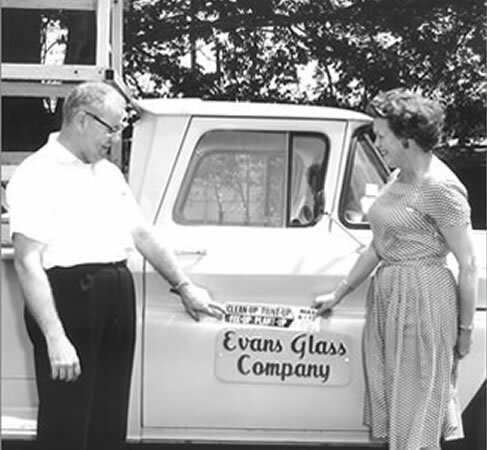 The Evans family has owned Evans Glass Company since it was started in 1956. Our original location was on Craighead Street in the Melrose area of Nashville. 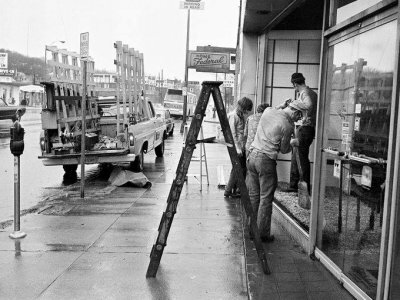 In 1968, the construction of I-65 forced us to move to our present location just off Spence Lane on Cornelia Street. Pictured in the photo is Bill's dad, his aunt holding a political sticker for Mayor Briley. Over the past 50 years, Evans Glass Company has helped many customers. We have served homeowners, homebuilders, architects, remodeling contractors, interior designers, realtors, and multiple generations within families. “I remember Nashville when” This picture is from 1975 with the Evans Glass Company truck on the left. The young man with shoulder length hair could be Bill Evans, as he worked every Christmas and every summer school break. I mean everyone!